It's for my Great Granddaughters First birthday & I wanted to make it personal & special :) so who do I turn to Miles Kimball !!!!! 3 year old wants to save money! For my great granddaughter. She just turned 2 October 11th. Both items a must. She loves to play with the coin 👛 like mine purchased from Mileskimball, and she literally loves money. Time to begin teaching her to save. This is the fourth bank I have purchased. Always met my satisfaction. I've bought one for every great-grandchild for 11 years! We fill it with change and give it to the child on hiis first birthday! Thiis is the twelfth one, so far! 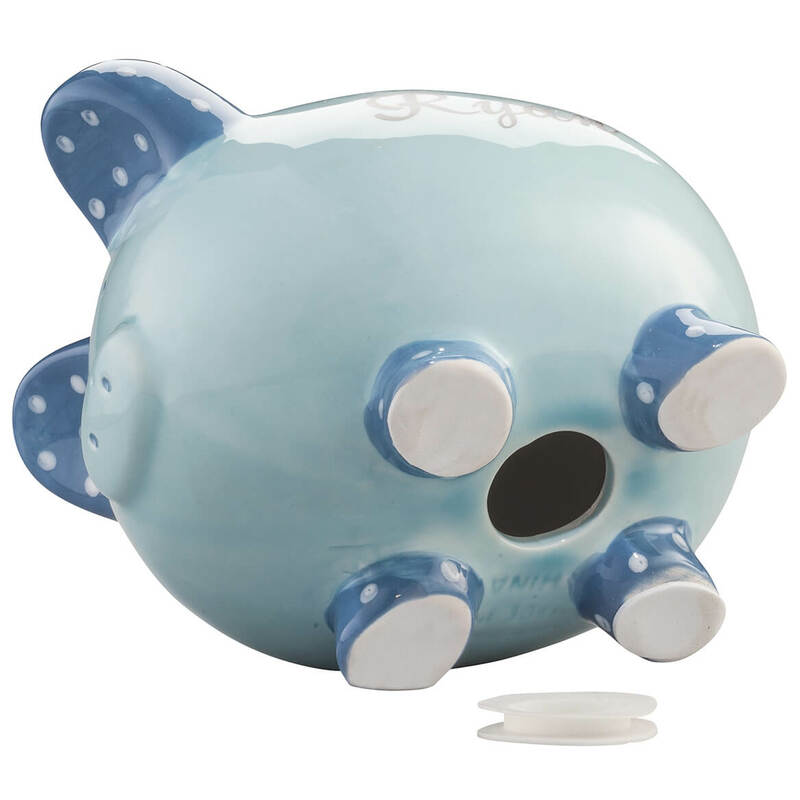 Every grandchild gets a piggy bank their first Christmas. have been purchasing this bank for 12 years...grandchildren, great nieces and great nephews are learning the value of saving with these banks. For the true ceramic, and the originality. But the size was the biggest seller for me! Most of the items will be used as gifts. It's very difficult to find personalized items in the mall anymore. So glad I found this piggy bank since I bought a bank for each of my older grandchildren. I bought one for my grandson last year, and they were all out of the pink for my granddaughter.. They are adorable. So I needed to order one for her this year before they ran out of stock. Quality was exceptional for the price. Plus it's for my grand daughter whom I love dearly. I could not find a piggy bank at a retail store so I went on line and found Miles Kimball and you had a great selection to choose from. I purchase for my grand daughter who likes to save hoping this will help her. Because it's his first Christmas. 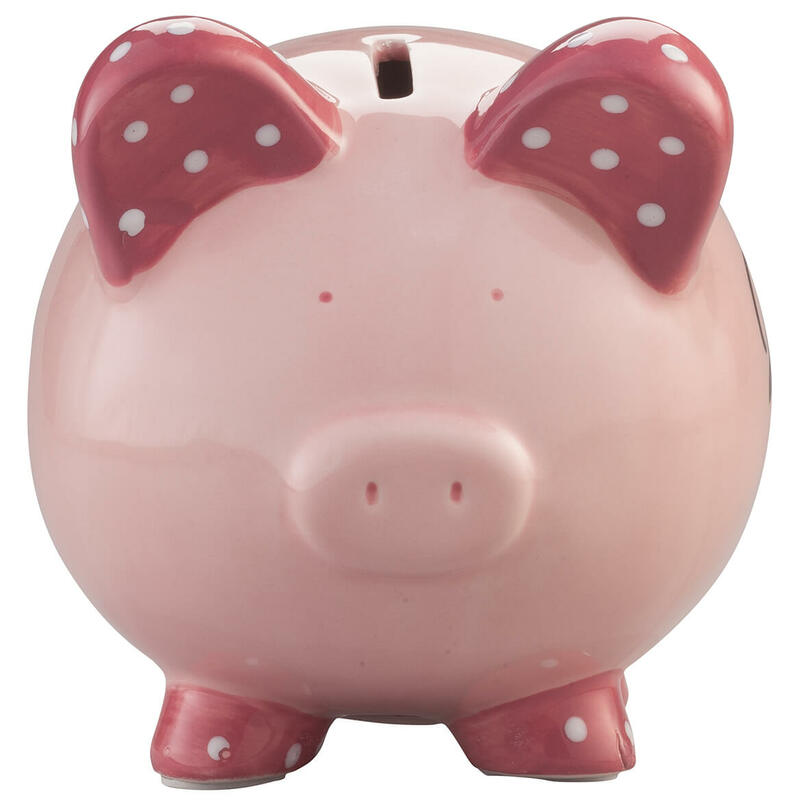 I had a plastic piggy bank when I was little. It had a hat that tipped whenever I put change into it. 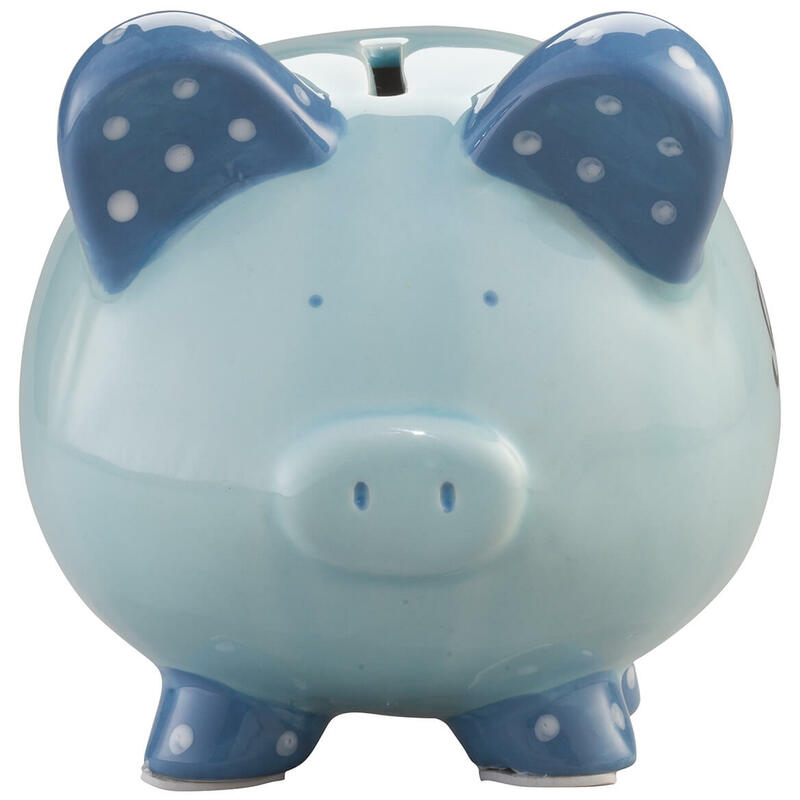 I still have that piggybank after 70 years or so. I thought it was time I bought them for my grandchildren and great grandchildren. One of a few choices which could be personalized. Each child has received one after they were born. They are great gifts. For my first great grand child. So that her parents can teach her to save money. I bought one before and loved it. I decided to get another for my other grand child. looking for something cute for grandson. 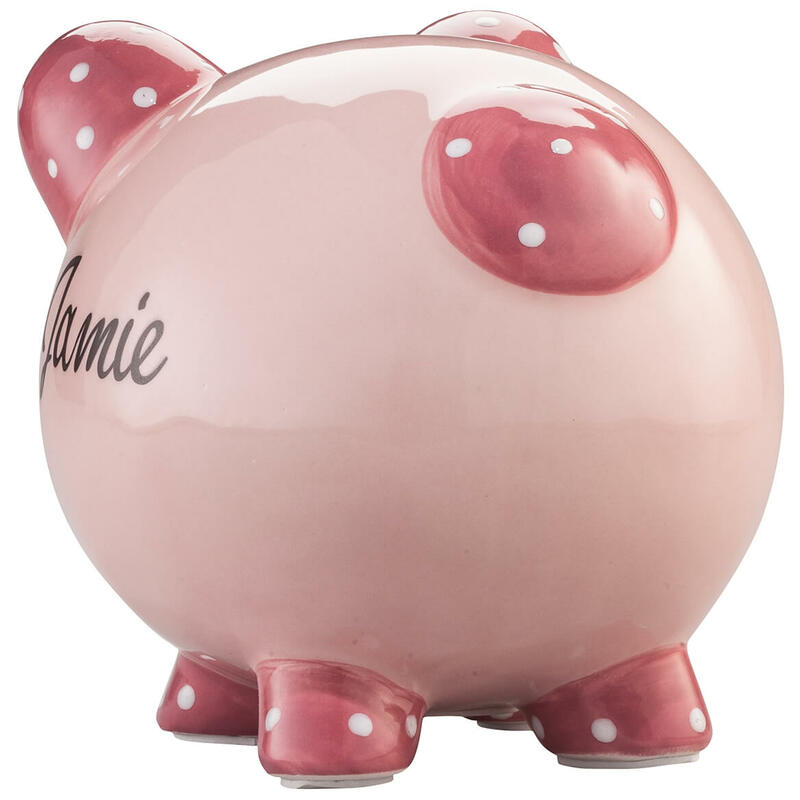 I ordered a Pink bank for my Great Granddaughter. 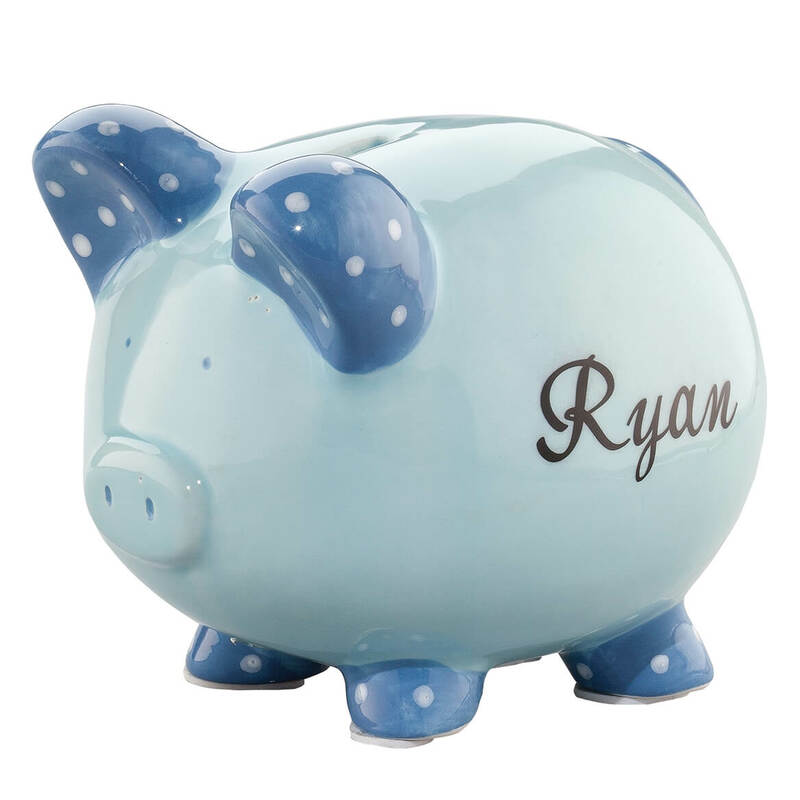 Because my son loves personalized items and he loves saving coins! I have been buying these for my great-grandchildren. purchased the same item a year ago for my twin grandsons an absolutely loved them! I have bought one for all three of my grandkids and they love it. I never noticed the difference. Still got the item in a very timely manner, within 2 weeks. No, I was surprised with the delivery within one week of placing the order. No ,received two piggy banks with in a week. Both where beautiful. Not really. Miles Kimbal's personalizing service is really Fast ! No, the bank was delivered in a timely manner. No - I received orders in a timely fashion. What size coins will the bank accept? BEST ANSWER: The 2nd answer (below) indicates 50c pieces will go in the bank. One other person answering this question said 50c pieces did NOT fit it the one he had. The coin opening is quite large so I would guess any coin will go in. I gave mine as a new baby gift and put quarters, nickles, dimes and pennies in it. All penny,nickel,dime,quarter,fifty cent if you can find them. I have bought six for all my grandchildren and never had a problem. How are the names adhered to bank? Sticker ? BEST ANSWER: Thank you for your question. 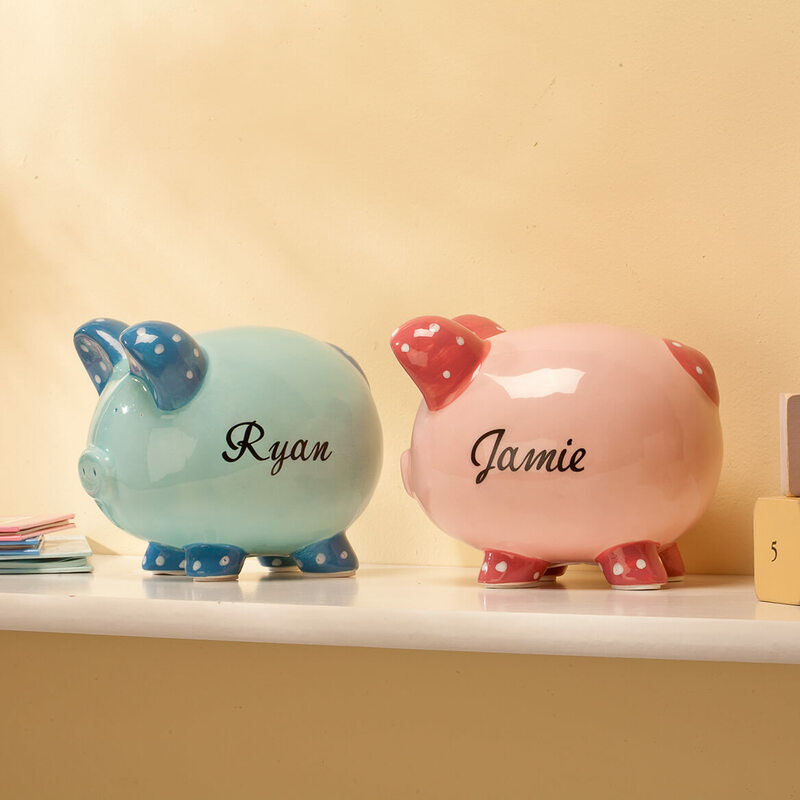 The piggy banks are hand painted. We hope this information will be of help to you. They are printed right on the bank. It is not a sticker. Can the font style be different? BEST ANSWER: Thank you for your question. Unfortunately we are not able to change the font style. We hope this information will be of help to you. Did I already order 2 pink & 2 blue banks? BEST ANSWER: Thank you for your question. The bank measures 6 1/2" long x 5 1/2" wide x 6" high. We hope this information will be of help to you. Is it possible to obtain the etched engraved name on this piggy bank like i did last year? BEST ANSWER: Thank you for your question. You need to select card only or card and envelope personalization on the select drop down menu. You will be taken to another screen to add your personalization, when completed you can add the cards to your cart. We hope this information will be of help to you.